Apple's rubber-banding patent that was crucial in its lawsuit against Samsung, but was ruled invalid two months ago, has suddenly snapped back into place at the U.S Patent Office. That's fitting for this "overscroll bounce patent," as Foss Patents has nicknamed it. Officially, it's known by the lengthy USPTO name "List scrolling and document translation, scaling, and rotation on a touch-screen display," according to the original filing. Whatever you call it, though, there's no denying that it was the most important component in the Apple-Samsung trial, which at first awarded Apple a $1.05 billion (about UK£668 million, AU$1.09 billion) victory. 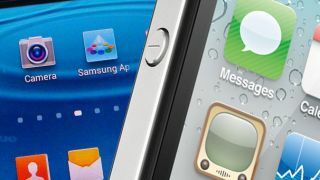 Claim 19 in the patent, specifically, found that more than a dozen Samsung devices, like Galaxy S2 and Galaxy Tab 10.1, infringed upon this Apple patent last year. However, the USPTO rejected all of the claims of the patent soon after, with "final Office action" upholding most of these rejections in April, according to a timeline by Foss Patents. While Samsung immediately pounced on this early decision two months ago, Apple knew that the "final" nomenclature didn't live up to the purest definition of the word. To Samsung's benefit, Apple's billion dollar victory was also not final. Earlier this year a judge halved the original settlement and ordered a new retrial.